We live in a hectic 24/7 world. Working hours have increased as has the available entertainment and other distractions. If you are a regular at the gym, your time is limited, and your purpose is to put some decent muscle on your frame, then this twenty minute Miracle Workout will do just that. You do not need to train for hours doing a huge variety of exercises to get swole. You can actually build a fairly decent physique just doing two exercises – Squats and Dips, but for a more complete physique you need four. Transform your entire physique training a total of one hour per week. Yes, three twenty minute workouts is all you need to completely develop your body. Sounds too good to be true I know, but bear with me. The Miracle Workout is primarily a hypertrophy routine but you need to up the intensity whenever you can. This will mean either progressively increasing the load on work sets, or reducing rest time between them. This will need to be done periodically as you progress in strength. The Miracle Workout employs four sets of eight reps utilising only four exercises. These are unsurprisingly all compound multi-joint movements. These four quality movements cover all the bases, and they are: Squat, Deficit Stiff Legged Deadlift, Dips and Chins. This system assumes a certain level of functional strength and conditioning. Dips and Chins both involve lifting the entire body weight through space and are simple moves but are not easy. If you are significantly overweight for example, this workout may not be for you, as yet. If you are unable to do multiple chin-ups however, these could theoretically be replaced by Barbell Rows or even Lat Pulldowns although these are an inferior exercise. Dips may surprise the uninitiated but in many ways they are the upper body squat. Like Chins they are a compound, multi-joint exercise which moves the entire body though space, and are therefore extremely effective. They will build the shoulders, chest and triceps primarily and are a superior chest exercise – better than the Bench Press for example, the so called king of chest exercises. Done weighted they are significantly more effective at putting meat on the upper body. Squats need no introduction and need to be done. If Squats are king, then Deadlifts are most certainly queen. Like Squats, Deadlifts elicit huge hormonal response precipitating systemic body adaptation. For hypertrophy however, we need to increase time under tension, and increase the stretch and eccentric component, so we do them stiff legged from a deficit. Chins will build the upper back and is also the best exercise for building bicep mass. If you can easily do eight chins add weight via a belt to increase resistance. There are no isolation exercises in this program. Neither are there any direct arm exercises, because contrary to what you might have been told, or read, they are not necessary. The biceps are involved in any pulling movements. The triceps are involved in any pressing or arm extension movement, and weighted Dips remain the superior movement to facilitate their development. Additionally the increased loads used by compound moves means all muscles are subjected to greater loads than when exercised in isolation. The body generally is not designed to be using muscles in isolation – it is usually an unnatural movement pattern. If your recuperative ability allows it, you can train this system four times a week. 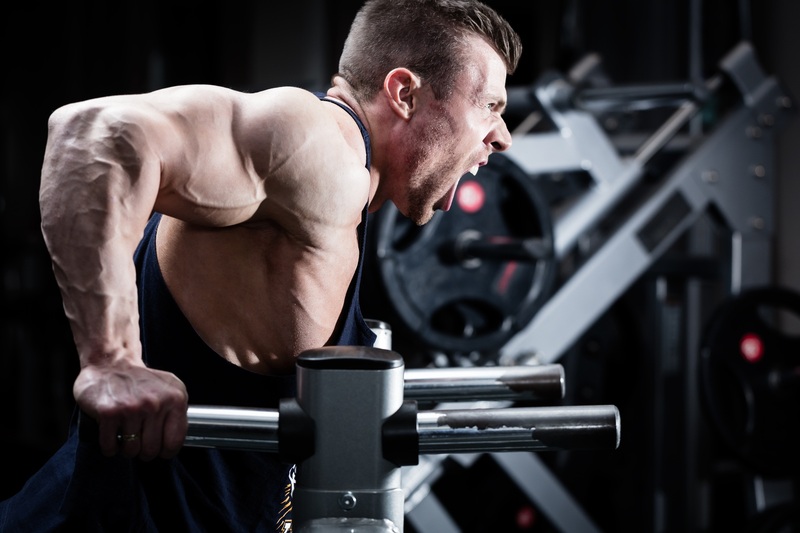 If your nutrition and recuperation are on point and you train with sufficient intensity this short simple routine will transform your physique fairly quickly.